Published in the New Scientist April 22, 1963. Fig. 1: The author on a Wooler prototype, 1948. A special type of madness is required to see the virtues in ancient vehicles as outweighing their manifold disadvantages.� And to endeavour to restore a mouldering pile of corruption to its original beauty (mainly in the eye of the beholder anyway) requires a fixity of purpose of monumental fatuity.� In my own case, there must be added to this an arrested development, in that motorcycles rather than cars are the main interest.� A panegyric on the fascination of motoring on two wheels, or perhaps three (a very different case), would fall on either deaf or already converted ears.� On first contact with the motoring bug, one either goes under or immediately becomes immune.� Most recover from the disease (marriage is an excellent cure), but a happy few remain �carriers�.� Of these, a small proportion �go vintage� (a vintage motorcycle or car is pre-1931.� Veteran classification varies according to the number of wheels but is roughly pre-1914). 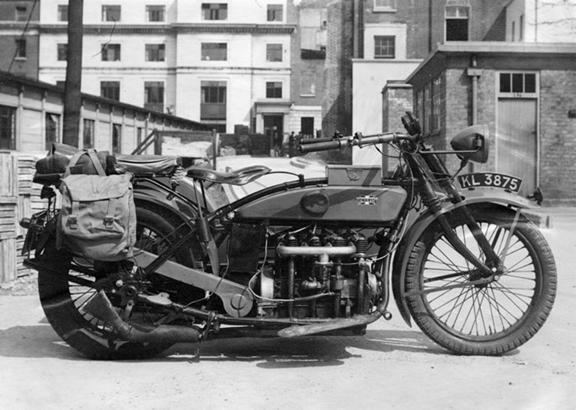 � A Vauxhall 4-cylinder motorcycle of the early twenties. 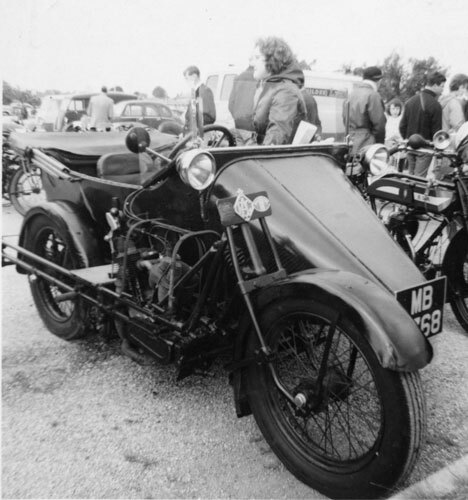 � A Scott �Crab�, designed to carry a machine gun in the first World War and converted to civilian use by means of a body enveloping both motorcycle and sidecar, and bestowing the appearance of a home-made car with one front wheel missing. 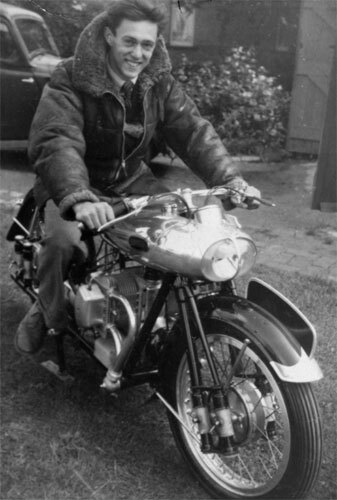 � A Model H Matchless, so impossibly well-sprung (without benefit of damping) that it felt something like riding a hippopotamus at high speed in deep mud. Financial considerations forced me into the gentle art of restoration, for the prices of utterly worn out machinery are not too high.� The net result is not cheaper, but amounts to a kind of never-never system-you never finish paying because, perfection being impossible, the job is never finished.� There is a sort of Fourth Bridge painting-effect too.� Some while ago I fell for the charms of a dilapidated Henderson, made in 1925 in Chicago, with a vast four-cylinder air-cooled engine of 1301cc.� This, together with the parts of three others, cost �4 10s.� I started real work on it three years ago, and have just reached the stage of fitting two or three parts together. Fig. 2: 1301cc 4-cylinder Henderson De Luxe, made in 1925. The restoration game must be played according to the rules, of course.� So far as is humanly possible the machine, when complete, must conform exactly to the catalogue specification (if indeed you can get a catalogue).� Copies of old motoring magazines must be hunted down, together with instruction books, contemporary photographs and advertisements.� Old gentlemen who rode the things in their youth must be found and remorselessly questioned.� The catalogue talks of �Packard Automobile cable�-so what was that like?� And again, were the cylinders really nickel plated and if so how far up?� Were they buffed or not? One must do as much work as possible oneself: one man I know even does his own plating.� Brush painting (sometimes stoved in the domestic oven) is essential, and woe betide the scoundrel who endeavours to give his sprayed paint the verisimilitude of brushwork with a coat of varnish.� Cellulose is quite unthinkable.� The plating must be nickel, not chromium-plated dull and then buffed (none of your new-fangled bright nickel).� All nuts and bolts must be quite free of spanner blemishes.� Aluminium castings must be brilliantly burnished (regardless of whether originally they were or not).�� Anachronisms like plastic-covered Bowden cables, pink sparking plugs, stiff nuts or PVC-covered wire must be carefully avoided. The results, after a prodigious amount of work, can be quite staggering.� Some of the machines submitted for the Concours D�Elegance at the Vintage Motor Cycle Club annual Banbury Run are unbelievable in their beauty, and this after completing some 70 miles round Oxfordshire to a tight time-schedule.� The imagination boggles at the effort involved.� This seemingly unattainable standard, strange to say, only seems to spur one on to further efforts.� It discourages the wife a bit, though. The appeal of vintage motorcycles is difficult to define.� Aside from extreme petrol economy and excellent accessibility they have no real advantages from the modern product.� Performance is sometime quite good, and a surprising degree of reliability is attainable (I once travelled 956 miles in two days on a 1926 AJS without trouble), but steering, suspension and brakes were dreadful by today�s standards.� However, the Heath Robinson appearance, the quaint oiling systems-viewed mostly through little windows and referred to as �spit and catch it�-the ingenious whimsicality of the accessories, the incredibly smooth transmission of a belt (until it rains, when it gets so smooth that the transmission ceases) and the delicate construction, all blend to a quite incurable addiction.� I must not omit the pleasant sensation of running a large slow-revving engine, as compared with the frantic buzzing, as of a berserk dynamo, from today�s minute power units. Let me leave you with one thought.� Anyone actually completing the restoration of a vintage motorcycle has the subconscious wish that on a death his relatives will keep it under glass on the mantelpiece as a sort of memorial or family heirloom.� �That�s great-granpa�s riding contraption.�� In fact, of course, it will be left to rust again in the garden shed or given to the totterman. Fig. 3: 1924 Seal 4-seater.� This machine, which is something between a motorbike and a car, has a capacity of almost a litre.